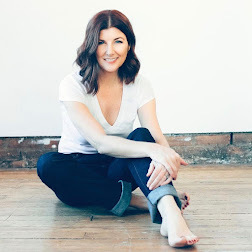 I've been a fan of independent radio since college. Those were the stations that would play the alternative 80s music that mainstream radio wouldn't and it was on these stations that I first discovered bands like The Cure, Siouxsie and the Banshees, The Smiths, Nemesis, and Depeche Mode. In the early 90's it was KDGE that showed support giving Dallas bands such as Course of Empire, Horton Heat, Deep Blue Something, Tripping Daisy, Sister 7 (as "Little Sister"), and Poi Dog Ponderingan early platform that launched them onto the national scene. 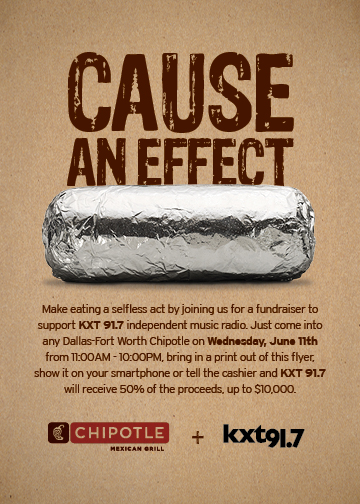 KXT 97.1 has picked up the "alternative" mantle for this era and in support of the format, all DFW-area Chipotle Mexican Grill restaurants will come together on Wednesday, June 11 to donate 50 percent of the day's proceeds (up to $10,000) to raise funds for public media from 11 a.m. to 10 p.m. To participate in the fundraiser, guests should visit http://kxt.org/2014/05/save-the-date-eat-at-chipotle-on-june-11-and-support-kxt/ to print and/or save the flyer above on your smartphone, then show it at checkout to ensure a percentage of that purchase goes to KXT 91.7. I'll be buying burritos to do my part to keep local bands and independent labels on the radio!